A renowned designer comes under fire for failing to acknowledge his Pakistan inspiration. British menswear fashion designer, Paul Smith, was in hot water this month. His smooth, jet-black leather sandals with their zany, strawberry pink trims, initially advertised as “Robert” on Smith’s website failed to credit Peshawar, Pakistan, as inspiration behind the chappals (sandals, in Urdu). 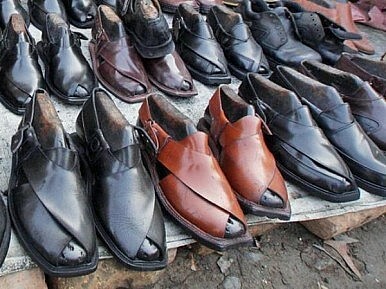 The handsome, sturdy Peshawari chappals, made on home turf, have been worn by Pakistani men in the region for eons. Countless shoemakers – specializing in the popular sandals – have churned out variations of the much-loved chappals in Pakistan for decades. The footwear, therefore, proudly carries a metaphorical Pakistani watermark. For Smith and his team, it would have been common courtesy to give credit where rightly due. Thanks to the wonders of social media (and a Change.org petition), Smith, who was criticized and lambasted for the intentional (or unintentional) boo-boo, caved. Almost immediately, the text under “overview” (on the particular page on Smith’s site) was edited to carry the words: “inspired by the Peshawari Chappal.” Why thank you Mr. Smith. Shah is correct. The power of social media is a potent force. Around the same time that the Smith chappals were being angrily paraded across social networking sites, someone I know posted a blog post on Facebook that criticized the fashion house, J Crew, for failing to credit Palestinian designs/patterns used on pumps for women. For fashion houses to claim an idea, a concept, a design – from a society of people – as their own is intellectual plagiarism. While Smith had the decency to rectify the damage, I really wonder why credit wasn’t given in the first place. Not only was the concept/design behind the sandal (formerly known as “Robert”) lifted from Pakistan, foreign buyers pay an enormous sum (about $500) for a product that costs far less in its place of origin: Peshawar. Neon pink, yellow, or azure trims don’t differentiate a work of art, fashion or design from the original. For art, that’s just too easy.